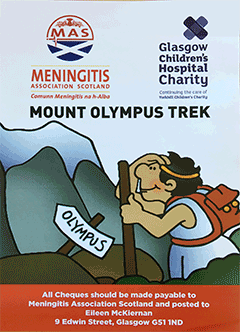 This year 5 intrepid walkers will be climbing Mount Olympus and raising money on behalf of Meningitis Association Scotland. The five walkers, Jack Allen, Robert Carachi, Jim Kerr, Ewan MacLeod and Eamon Murtagh, came together to attempt long and challenging walks to fundraise for charity. 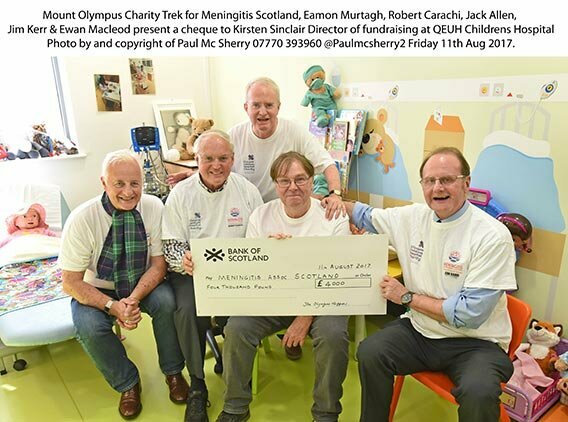 This year the team are supporting Meningitis Association Scotland with a fundraising effort to enable the Glasgow Children's Hospital Charity to purchase a Neurosurgical Endoscope. MenScot have already donated Â£4,000 to the fund to buy the Endoscope - a tool that will be used surgery for children with the most serious brain conditions including brain tumours, cysts and hydrocephalus (a life-threatening build-up of water on the brain). 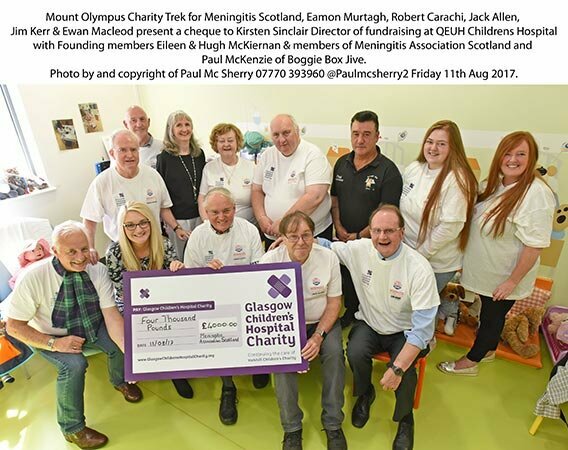 You can support the team by donating directly through the Meningitis Association Scotland fundraising page at Charity Choice. 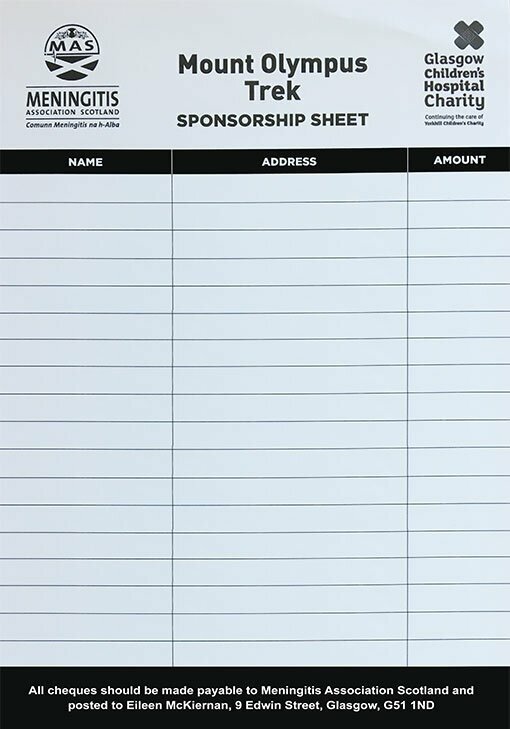 Alternatively, you can download a sponsorhip form and help with the team's fundraising efforts (all cheques payable to 'Meningitis Association Scotland'). Good luck to all the team and thank you for your support! In very positive news just released the Joint Committee on Vaccinnation and Immunisation (JCVI) have recommended the use of the recently licensed MenB vaccine, Bexsero® for infants. "As you will read, this does mean infants will have free access to the MenB vaccine in due course and hopefully this will have a positive impact and reduce the risk towards meningococcal B meningitis". Click here for photos from the Meningitis Association Scotland Ball (05 November 2011). 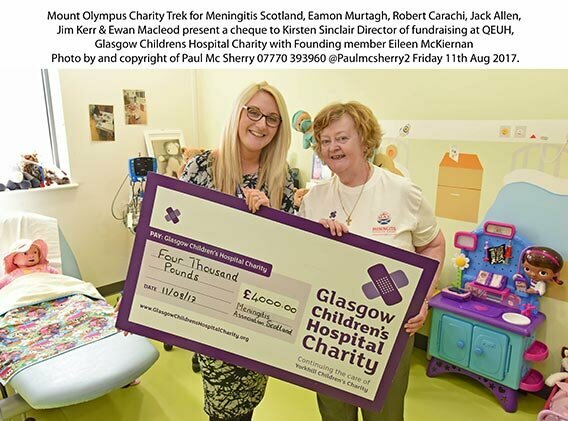 Eileen McKiernan, Founder and Chief Executive for Meningitis Association Scotland, has been awarded an MBE for Voluntary Services to Healthcare. The former Evening Times Scotswoman of the Year, has worked tirelessly to raise funds for research into the disease. Her involvement began after the tragic loss of her own son Lee McKiernan aged 17. The full Queens birthday honours list can be downloaded from the DirectGov website. Find out information about the different types of Meningitis, their identification, recovery & other general information. Any assistance you can provide to the Association will help in funding & research into Meningitis. You can help us by making a donation with * Charity Choice. Click here to go directly to the donation page.